A changing Table organiser is a great addition to any baby changing table. Sometimes when you are in a hurry to change your baby’s nappy, you may forget to bring some necessary things like baby powder or baby wipes. If you have a baby changing table organiser nearby, then you can put all the things that you are going to need to change your baby’s diaper. Then you can change them easily without looking for things in different places. There are many brands of changing table organisers to choose from and they are available at a local furniture stores or online. The price of a baby changing table organiser will vary depending on brand, quality, and material used. 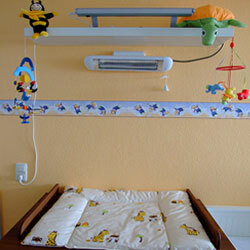 Metal frame – the changing table organiser must be assembled when you buy them. It has a metal frame and has wheels. They can cost more than other changing tables made from other materials. Plastic – Most of these plastic changing table organisers are designed to fit in to the bottom layer of your changing table for easy access to meet all your diaper changing needs. Cloth – These are designed to be hung on the wall or wall mounted. Wood – There are only a few of these designs available. A changing table organiser that is completely made of wood is rare because of the manufacturing cost. However, if you want to have one, you could always go to a furniture store and order a custom made one online. Depending on your budget and your preference, you will have plenty of them to choose from. When choosing the right changing table organiser to buy, it is always good to know what other people think about which brands are good. Prince Lionheart – Known for their baby organisers that are made from plastic. People who have owned their products gave them a score of 4 out of 5 stars. Their popular products include: the Price Lionheart Diaper Depot Clear and the Prince Lionheart Dresser Top Diaper Depot. Munchkin – Another popular brand. Their products varies in the materials used, ranging from plastic to metal frames. The ratings from the people who has actually owned a changing table organiser from this brand is mixed. There are some good and some bad products. DEX – their organisers are mostly wall mounted. Their products have good scores from the owners who have purchased them giving mostly 4 out of 5 stars. Products currently out in the market are: Dex Products Ultimate Baby Organiser and Dexbaby Nursery Organiser. JJ Cole – Makers of colourful baby organisers. Their products are available in different colours to choose from. Although, the designs seems similar. Most people gave these changing table organisers from JJ Cole 5 out of 5 stars and there are some who gave them 4 out of 5 stars because of some design faults. A Changing Table Organiser comes in all sorts of shapes and sizes which you can choose from. The design will vary, so make sure to choose what will work for you.